Cycling in Bangkok. Probably not the first thing that comes to mind when thinking about Bangkok. However, exploring Bangkok by bicycle is an exciting way to experience Thailand’s capital. Bangkok Biking shows you a part of Bangkok that you’ll never see from the skytrain, tuk-tuk or taxi! the heart of Bangkok’s business-districts and of course we managed to set out a routing that avoids most of the traffic. “Colors of Bangkok” is a 4-5 hour amazing bicycle tour through Bangkok Metropolis. 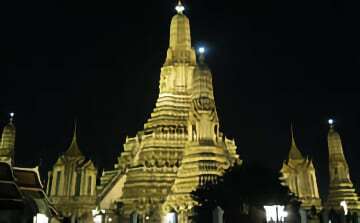 During the trip participants get to see the remarkable contrasts that Bangkok Metropolis has to offer. 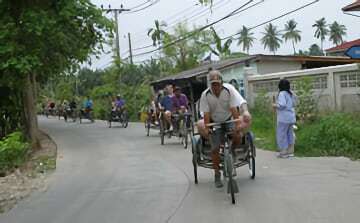 The cycling part of Colors of Bangkok Weekend Edition is similar to the regular Colors of Bangkok but the Weekend Edition takes about 1,5 to 2 hours longer and is extended with some extras. ‘Rickshaw & Hike the Colors of Bangkok’, the perfect tour for people who would like to experience the ‘Colors of Bangkok’, but prefer to walk instead of cycle. “Bangkok Sunset Ride” is a very gentle 4-4,5 hours culinary and cultural bicycle ride through Bangkok’s Thonburi side. Discover the beauty of Bangkok by night during this amazing bike adventure! Our full day Bangkok Paradise tour brings you to an undiscovered and unseen part of Bangkok, even for local people. Experience the real Bangkok, far away from the crowded tourist areas! ‘Colors of Damnoen Saduak’ is a relaxed bicycle ride from Damnoen Saduak floating market through Amphawa district. Secrets of Siam is a two day boat & bike tour. During the excursion participants see an abundance of nature and we bring you to places seldom visited by tourists.